You’ll need the following columns set up in excel, just copy them to your clipboard (Ctrl+C), be sure to exclude the header row. The column names do not matter but the column order does matter. 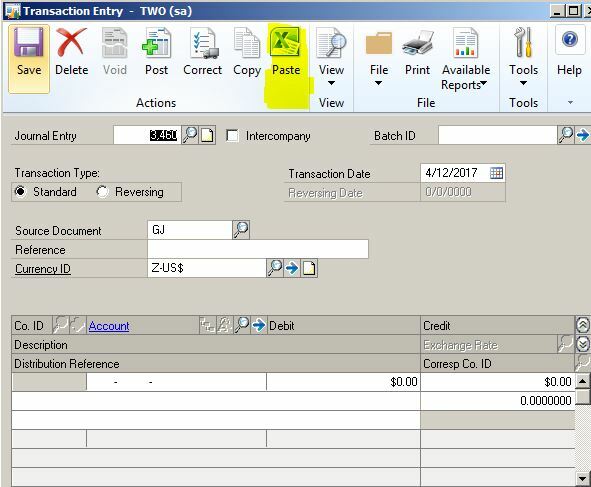 Open up the GL transaction entry window and choose Paste, be sure the journal entry window is blank, otherwise the paste button will be greyed out. You cannot use the Ctrl+V shortcut – you must click on the paste button in yellow. If you click the paste button with one or more invalid GL account(s) nothing will be brought into the journal entry window and you must fix the issue first. Plus, you will get a report showing the invalid accounts. You can only copy/paste one journal entry at a time. However, this is such an improvement over the multi-user issues with text files and integration manager. This entry was posted in Dynamics GP. Bookmark the permalink.